Blantyre Cultural center stage is set as red carpet is rolled out while suspected state security agencies mingle in the crowd. All of sudden everyone looks stunned as serene environment grips the venue of Easter Festival here. Soon after the red carpet is rolled out, a bespectacled gentleman in a grey suit, accompanied by First Lady walk on the stage, smartly dressed bodyguards behind them. With a booming voice that vibrates the stage, locals are taken aback as the voice says it all. Former Malawi President Doctor Bakili Muluzi is now speaking publicly to Malawians. ‘’Ladies and gentlemen let me welcome you to this wonderful event. Correctly speaking I welcome you all. Lelo ndimanene kunena kuti tiyeni pamozi pachikala pachobozi. There must be love in this country. If there is no love this country will not develop my fellow countrymen abambowe. Thank you, thank you’’ he says as the crowd burst into laughter. Muluzi was the first democratically elected president for Malawi in 1994 ending nearly a three decade rule by Kamuzu Banda. This is a rare occasion for theater lovers here as Frank Peter Naligonje brings back those memories. ‘’My art of mimicking is about bringing memories. 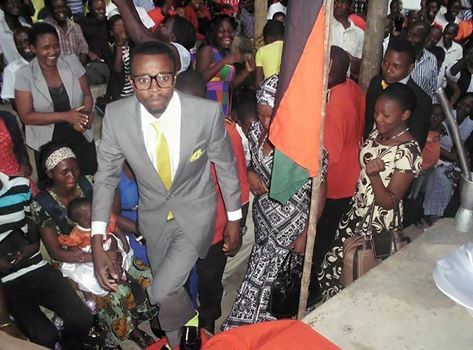 I admire former president Muluzi on the way he dressed as well as movement. Apart from that I am concerned about my attire to compliment everything I do for the occasion. So whatever I do I try to have the best suits, my bodyguards are well dressed during the act’’, he says. Naligonje is an artist who is open to criticism. ‘’As an artist, I am looking forward to mimic the way American President Barrack Obama speaks and African leaders including our own President Robert Mugabe. I will try to improve during my shows’’ he says. Naligonje is among several poets, comedians, drama actors as well as traditional dancers including Zimbabwean’s Icon Theater Production representing the country here. Bulawayo based stand-up comedian Clive Chigubu kicked off his comics in Lilongwe on Friday before the event was switched to Blantyre 311 kilometers away. The Malawi Easter Festival is hosted by Solominic Theater where 90 artists from Zambia, Zimbabwe and locals from remote districts are gearing themselves to showcase their talents during three days arts festival.